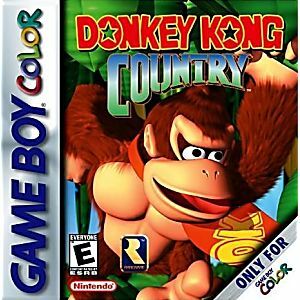 Donkey Kong Country Game Boy Color Game Cartridge Cleaned, Tested, and Guaranteed to Work! Good condition. Works perfectly. Cool looking clear cartridge. It is what it is. The game runs a bit faster on the color than original. And you dont see the other ape when you collect them. But other than that its Donkey Kong Country. I'm a fan of Donkey Kong Country on the snes, which this game is a miniaturized remake of. But although this game itself is great, I really can't recommend it for the gameboy, because to me the screen is just too small and this game clearly wasn't meant to be played on a gameboy. Pros: Graphics look amazing for the gameboy. Donkey and diddy are nicely animated and overall the game looks beautiful. Like in the original, gameplay is amazing, with lots of items to collect and hours of fun. The music is pretty good considering it's being pumped through the game boy's tiny speaker. Cons: When I say that the screen feels to small, I mean that it feels like too much stuff is packed into a small space. Playing the game quickly makes me nauseated, which isn't a problem with my other gameboy games. My overall recommendation: If you must have donkey kong country on the go, go ahead and get it. I hate to say it, but otherwise you'd be better off buying the SNES version. This game is a port of the SNES game of he same title and contains all the quirky wacky goodness of the SNES game in a smaller package. If you like DK and like riding rhinos then this is obviously the game for you.